The cornea and sclera stand in the way of this more convenient, less invasive drug delivery modality. 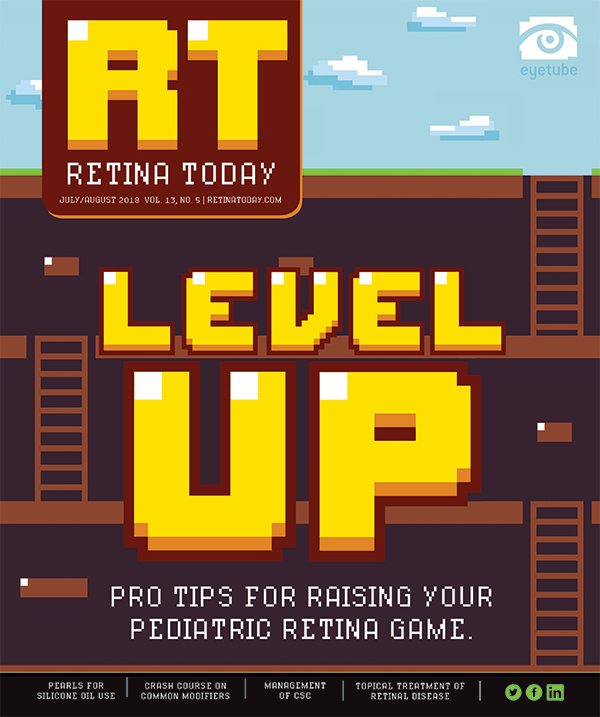 Topical modes of delivery are being evaluated by a variety of researchers for their potential in retinal disease treatment. The ability to use the topical route of administration would convey important advantages in contrast to intravitreal injections, including greater convenience, less invasiveness, and less discomfort. • For topical medications to be feasible for the treatment of retinal disease they must be able to penetrate the cornea or sclera with sufficient drug levels to deliver a biological effect to the posterior segment. • Ideally, topical drugs would either replace or significantly reduce the treatment burdens of intravitreal injections on patients, caregivers, and physicians. • For the foreseeable future, topical treatments will likely remain relegated to adjunctive roles and will not replace anti-VEGF therapy. If efficacious topical delivery becomes possible, drops might be used prophylactically to reduce the formation of new blood vessels. Or, at the onset of macular edema—when it is desirable to avoid injections but treatment could be beneficial to halt progression—drops might be used instead of intravitreal injections. Topical medication might also be a plus in patients with choroidal neovascularization in only one eye but high-risk drusen and pigment alterations in the other eye. For topical medications to be viable for the treatment of retinal disease, however, they must be able to penetrate the cornea or sclera with sufficient drug levels to deliver a biological effect to the posterior segment. At the same time they must not be so strong that they present a risk of toxicity on the way to their target. Several companies are conducting phase 1 or preclinical studies, developing vehicles to allow a topically applied drug to penetrate the eye better or to remain in contact with the cornea and the sclera for longer periods. Current ophthalmic topical formulations do not achieve sufficient drug levels in the posterior segment to be efficacious. After instillation of a drop, most of it is cleared from the ocular surface by the nasolacrimal duct, tear turnover, and blinking.1 Moreover, the corneal epithelium acts as a barrier, and so the amount of drug reaching the aqueous humor is severely limited.2 It is estimated that only about 5% of a topically applied medication penetrates the cornea and sclera. And from there, it still has a distance to travel to the posterior segment. Strategies that have been employed to increase topical drug bioavailability can be broadly divided into those that enhance drug penetration and those that provide sustained-release drug delivery (Table).3 Nanoparticles, gels, and ointments have been used in attempts to keep drugs in contact with the anterior cornea long enough to achieve adequate penetration. In the field of drug delivery, nanotechnology is being used to enhance absorption and penetration of drugs across membranes; to allow controlled release of the drug; and to target drugs toward distinct tissues to enhance their bioavailability.4,5 Advances in nanotechnology have led to investigation of topical liposomes, emulsions, and microspheres. Noteworthy attempts at delivering topical medication to the back of the eye have ended prematurely in several cases. Ohr Pharmaceutical initiated a phase 3 trial of topical squalamine (squalamine lactate ophthalmic solution, 0.2%) in combination with injections of ranibizumab (Lucentis, Genentech) for treatment of wet age-related macular degeneration (AMD).11 However, topical squalamine failed to reduce the average number of ranibizumab injections required by the clinical trial participants. Similarly, an inhibitor of complement activation known as PPADS appeared to offer promise in prevention of choroidal neovascularization,12 but the study was halted after unsatisfactory proof-of-concept results were reported in 2014. At present, the topically applied drugs that have shown the most promise are potential adjunctive therapies—that is, drugs that would serve to boost the effect of, for example, anti-VEGF drugs delivered by intravitreal injection. An efficacious topical adjunctive therapy might allow physicians to reduce the number of intravitreal injections in a patient’s regimen. As promising as these recent findings may be, eye drops used as adjuvant therapies along with injections are not likely to be considered for approval by the US FDA. Ideally, topical drugs would either replace or significantly reduce the treatment burdens of intravitreal injections on patients, caregivers, and physicians. For the foreseeable future, it seems that topical treatments will remain relegated to adjunctive roles and will not replace anti-VEGF therapy. 1. Deguchi S, Otake H, Nakazawa Y, Hiramatsu N, Yamamoto N, Nagai N. Ophthalmic formulation containing nilvadipine nanoparticles prevents retinal dysfunction in rats injected with streptozotocin. Int J Mol Sci. 2017;18(12):12.E2720. 2. Bourlais CL, Acar L, Zia H, et al. Ophthalmic drug delivery systems—recent advances. Prog Retin Eye Res. 1998;17(1):33-58. 3. Souza JG, Dias K, Pereira TA, et al. 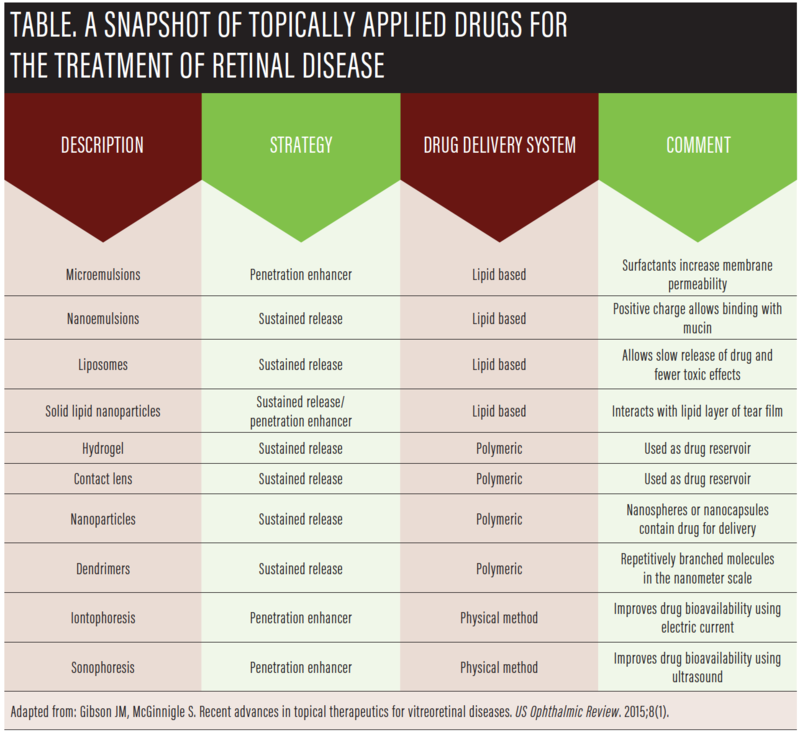 Topical delivery of ocular therapeutics: carrier systems and physical methods. J Pharm Pharmacol. 2014;66(4):507-530. 4. Yasukawa T, Ogura Y, Tabata Y, et al. Drug delivery systems for vitreoretinal diseases. Prog Retin Eye Res. 2004;23(3):253-281. 5. Sahoo SK, Labhasetwar V. Nanotech approaches to drug delivery and imaging. Drug Discov Today. 2003;8(24):1112-1120. 6. Honda M, Asai T, Oku N, Araki Y, Tanaka M, Ebihara N. Liposomes and nanotechnology in drug development: focus on ocular targets. Int J Nanomedicine. 2013;8:495-503. 7. Davis BM, Normando EM, Guo L, et al. Topical delivery of Avastin to the posterior segment of the eye in vivo using annexin a5-associated liposomes. Small. 2014;10(8):1575-1584. 8. Fujisawa T, Miyai H, Hironaka K, et al. Liposomal diclofenac eye drop formulations targeting the retina: formulation stability improvement using surface modification of liposomes. Int J Pharm. 2012;436(1-2):564-567. 9. Takashima Y, Tsuchiya T, Igarashi Y, et al. Non-invasive ophthalmic liposomes for nucleic acid delivery to posterior segment of eye. Yakugaku Zasshi. 2012;132(12):1365-1370. 10. de Cogan F, Hill LJ, Lynch A, et al. Topical delivery of anti-VEGF drugs to the ocular posterior segment using cell-penetrating peptides. Invest Opthal Vis Sci. 2017;58(5):2578-2590. 11. Efficacy and safety study of squalamine ophthalmic solution in subjects with neovascular AMD (MAKO). ClinicalTrials.gov. clinicaltrials.gov/ct2/show/NCT02727881. Accessed June 6, 2018. 12. Birke K, Lipo E, Birke MT, Kumar-Singh R. Topical application of PPADS inhibits complement activation and choroidal neovascularization in a model of age-related macular degeneration. PLoS One. 2013;8(10):e76766. 13. Watsky MA, Jablonski MM, Edelhauser HF. Comparison of conjunctival and corneal surface areas in rabbit and human. Curr Eye Res.1988;7(5):483-486. 14. Obert E, Strauss R, Brandon C, et al. Targeting the tight junction protein, zonula occludens-1, with the connexin43 mimetic peptide, αCT1, reduces VEGF-dependent RPE pathophysiology. J Mol Med (Berl). 2017;95(5):535-552. 15. Sridhar J, Hsu J, Shahlaee A, et al. Topical dorzolamide-timolol with intravitreous anti-vascular endothelial growth factor for neovascular age-related macular degeneration. JAMA Ophthalmol. 2016;134(4):437-443. 16. Pinna A, Blasetti F, Ricci GD, Boscia F. Bromfenac eyedrops in the treatment of diabetic macular edema: a pilot study. Eur J Ophthalmol. 2017;27(3):326-330.